Opening Reception: Thursday, Sept. 25, 6 to 8 p.m.
"Invisible Rays: The Surrealism Legacy"
“Whether or not his movement of poets, painters and provocateurs won any wars is debatable,” said Michael Rush, curator of “Invisible Rays: The Surrealism Legacy,” and Henry and Lois Foster Director of the Rose. “But what is certainly true is that the surrealist preoccupation with dream states, the unconscious, and the blending of objects and ideas from different disciplines and cultures has had a profound influence on artistic practices to the present day.” The surrealists, Rush added, sought nothing less than the liberation of the human race by unleashing the powers of the unconscious. For artists this meant both a formal exploration of dream states (Georgio de Chirico, Salvador Dali) and a free form expression of ideas in collages and assemblages (Marcel Duchamp, Max Ernst). Drawing from the Rose’s extraordinary collection of modern and contemporary art, the exhibition will include more than 30 artists, including Roberto Matta, Yves Tanguy, Salvador Dali, Kay Sage, Jean Cocteau, Joan Miró, Max Ernst, René Magritte, Jackson Pollock, Gregory Crewdson, Fred Tomaselli, Tracey Moffatt, Jessica Stockholder, Elizabeth Murray, Kenny Scharf, Robert Cahen and Philip Taafe, among others. A specially designed exhibition space will reflect the atmosphere of the “International Exhibition of Surrealism,” presented at the Galerie Beaux- Arts in Paris in 1938. “Project for a New American Century” is the title of an 80-foot long work on paper by artist Dominic McGill, which will be featured in this exhibition of new works from the Rose collection. According to Rush, McGill’s monumental artwork is a panoply of images, texts, slogans and multiple narratives that addresses America’s complex history and current status as an economically wounded and threatened world power. Presented on the eve of America’s next presidential elections, McGill’s work addresses issues crucial to us all. In the past three years, the Rose has been given or was able to purchase more than 60 works of art that reflect the most important trends in contemporary art. “Project for a New American Century” will include paintings, photographs and works on paper from dozens of artists, including Matthew Antezzo, Roy Arden, Joanne Greenbaum, David Reed, Beat Streuli, Jim Hyde and Jessica Stockholder. The exhibition is curated by guest curator Randi Hopkins. “Drawing on Film,” surveys the practice of “direct film” - the process of drawing, scratching, or otherwise manipulating film stock to create images without a camera. The exhibition was organized by the Drawing Center in New York and curated by João Ribas. The series will present works spanning from the late 1930s to the present and will highlight an overlooked facet of experimental film. Many of the films are seminal examples within the history of the genre, while more contemporary works are being screened for the first time. By showcasing films from eight decades, the exhibition will present an overview of the rich legacy of direct film. Beginning in the 1930s, Len Lye (b. 1901, New Zealand) developed hand tooled filmmaking methods that defined the genre. His groundbreaking “A Colour Box” (1935), considered to be the first direct film to have been screened to a general audience, presents a dizzying parade of vibrantly colored scratched lines, squiggles and arabesques set to a rhythmic Cuban soundtrack. Another pioneer of the genre, Norman McLaren (b. 1914, Scotland), used the practice of direct film to develop innovative ways to manipulate film stock, including cross-fading techniques, paper cutouts and sequential etchings. Beginning in the mid-1950s, Dieter Roth (b. 1930, Germany) created a series of hand-drawn films including “Dot” (1956–62), in which he perforated black film stock with a variety of different sized holes, creating a pulsating interplay of light and shadow. 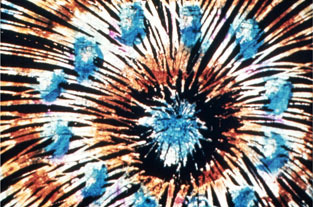 Throughout the 60s, 70s, and 80s, a growing number of artists looked to the process of direct film, establishing a period of experimentation reflected in the work of Pierre Hébert, Robert Breer, and Stan Brakhage. The legacy of direct film today includes artists and filmmakers such as Amy Granat (b. 1976, Missouri) who uses a controlled process that involves manually scratching 16mm film with razors, hole punchers and other tools. “Drawing on Film” will feature works by Stan Brakhage, Robert Breer, Amy Granat, Pierre Hébert, Len Lye, Norman McLaren, Bärbel Neubauer, Jenny Perlin, Jennifer Reeves, Richard Reeves, Dieter Roth, Harry Smith and Jennifer West. The exhibition will transform the Lee Gallery into a screening room with a 74-minute program of films by 11 artists that will screen several times daily. A separate evening screening of work by Stan Brakage will be shown in 16 mm format on Oct. 30. On Oct. 2 Amy Granat will screen her scratch films as part of a live performance and collaboration with composer Stefan Tcherepnin. Located on the campus of Brandeis University in Waltham, Mass., The Rose Art Museum was founded in 1961. Over the past 40 years The Rose has earned a considerable reputation for its collections and exhibitions. The collection contains significant holdings in post-War American art including iconic works by Jasper Johns, Robert Rauschenberg, Willem DeKooning, Roy Lichtenstein, Andy Warhol and numerous others. The Brandeis art collection of approximately 6,000 objects is considered one of the most significant and comprehensive collections of modern and contemporary art in New England. During the past four decades, The Rose has organized landmark exhibitions including Bruce Conner’s and Louise Nevelson's first one-person exhibitions (1965 and 1967 respectively), Frank Stella’s Protractor Series (1969), the first US museum video art exhibition “Vision and Television” (1970), Helen Frankenthaler’s work from the 1950s (1981), Kiki Smith' and Ellen Gallagher’s first one-person museum exhibitions (1981 and 1993), and the award-winning “More than Minimal” (1996); Roxy Paine (2002); Barry McGee (2003); “DreamingNow” (2004); and "Balance and Power: Performance and Surveillance in Video Art" (2006). -Norman McLaren, Blinkity Blank, 1955. © National Film Board of Canada. Film still. -Richard Reeves, Linear Dreams, 1997. © Richard Reeves. 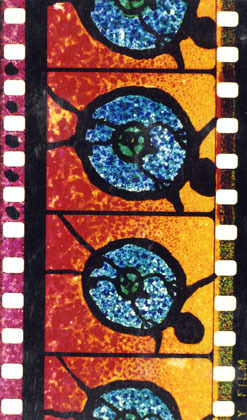 Film strip detail.